COLUMBUS, Ohio, Oct. 12, 2018 (GLOBE NEWSWIRE) -- Washington Prime Group Inc. (NYSE: WPG) continues to proactively manage its exposure to department stores situated within its Tier One and Open Air assets. This has been accomplished by the continued redevelopment of WPG owned department store space as well as the acquisition of space owned by retailers, including Sears. 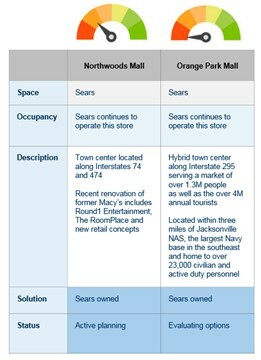 These capital allocation decisions continue to further the Company's dominant secondary town center mandate via differentiated adaptive reuse where sales volume increases up to threefold. Lou Conforti, CEO and Director of Washington Prime Group stated: "Two weeks ago we decided to once again raise the bar as it relates to department store visibility in particular and overall corporate transparency in general. 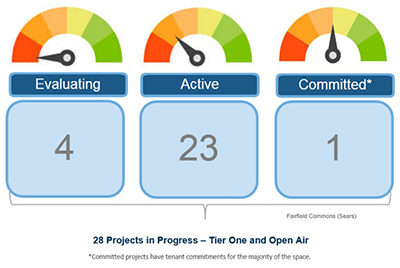 During the Bank of America Merrill Lynch Global Real Estate Conference we supplemented our institutional investor presentation with a detailed progress report on every single one of the 28 department store spaces we consider ‘at risk', which includes Sears exposure, in our Tier One and Open Air portfolio, excluding those spaces owned by Seritage or other non-retailers. In summary, we are actively planning redevelopment and/or are in discussions for 24 of the 28 spaces. The aforementioned presentation is available on the investor relations section of our website." Conforti added: "We've worked diligently to address unproductive department store space over the previous couple of years and recent reports of an imminent Sears bankruptcy filing shouldn't come as a surprise to any landlord unless they own a few Zayre or E.J Korvette locations trapped in a space-time continuum where the Sansabelt clad relax on shag carpeting, illuminated by the warm glow of a lava lamp while they drink Tang and vodka and listen to The Moody Blues." The Company has allocated approximately $300 million to $350 million of capital necessary to retrofit the aforementioned 28 spaces over a three to five year period. These costs are included in the Company's previously announced anticipated redevelopment spend of approximately $100 million to $125 million per annum. This excludes 13 spaces owned by third parties such as Seritage Growth Properties. Conforti stated: "Tenants which have failed to evolve in order to satisfy an increasingly savvy consumer do not belong in our assets. For those who embrace this necessary dynamism, respect their demographic constituencies and practice good old fashioned merchandising, we will bend over backwards by providing our robust infrastructure to ensure their success. Dillard's is one such example of a department store retailer that is continually evolving and beta testing new product offerings whether it be their successful vintage handbag rollout or any number of exciting initiatives which target a specific audience. "Bottom line: Washington Prime Group has and will continue to act as both a prudent asset and risk manager as we subject capital allocation decisions from both an absolute and relative (compared to our other investment opportunities) standpoint; and dispose of assets we deem as unproductive e.g. those which do not warrant a marginal unit of capital. We have the financial wherewithal to redevelop department store boxes which satisfy our ROIC parameters as well as result in the repositioning of the asset as the dominant town center within its catchment. In addition, we need to disabuse the farcical notion of a Sears bankruptcy filing (whether or not it comes to fruition) will come as a surprise to us. We have taken the appropriate financial, operational and strategic measures, and as a result regard such events as an opportunity." This news release contains "forward-looking statements" within the meaning of the Private Securities Litigation Reform Act of 1995 which represent the current expectations and beliefs of management of Washington Prime Inc. ("WPG") concerning the proposed transactions, the anticipated consequences and benefits of the transactions and the targeted close date for the transactions, and other future events and their potential effects on WPG, including, but not limited to, statements relating to anticipated financial and operating results, the company's plans, objectives, expectations and intentions, cost savings and other statements, including words such as "anticipate," "believe," "plan," "estimate," "expect," "intend," "will," "should," "may," and other similar expressions. Such statements are based upon the current beliefs and expectations of WPG's management, and involve known and unknown risks, uncertainties, and other factors which may cause the actual results, performance, or achievements of WPG to be materially different from future results, performance or achievements expressed or implied by such forward-looking statements. Such factors include, without limitation: changes in asset quality and credit risk; ability to sustain revenue and earnings growth; changes in political, economic or market conditions generally and the real estate and capital markets specifically; the impact of increased competition; the availability of capital and financing; tenant or joint venture partner(s) bankruptcies; the failure to increase mall store occupancy and same-mall operating income; risks associated with the acquisition, (re)development, expansion, leasing and management of properties; changes in market rental rates; trends in the retail industry; relationships with anchor tenants; risks relating to joint venture properties; costs of common area maintenance; competitive market forces; the level and volatility of interest rates; the rate of revenue increases as compared to expense increases; the financial stability of tenants within the retail industry; the restrictions in current financing arrangements or the failure to comply with such arrangements; the liquidity of real estate investments; the impact of changes to tax legislation and WPG's tax positions; failure to qualify as a real estate investment trust; the failure to refinance debt at favorable terms and conditions; loss of key personnel; material changes in the dividend rates on securities or the ability to pay dividends on common shares or other securities; possible restrictions on the ability to operate or dispose of any partially-owned properties; the failure to achieve earnings/funds from operations targets or estimates; the failure to achieve projected returns or yields on (re)development and investment properties (including joint ventures); expected gains on debt extinguishment; changes in generally accepted accounting principles or interpretations thereof; terrorist activities and international hostilities; the unfavorable resolution of legal proceedings; the impact of future acquisitions and divestitures; assets that may be subject to impairment charges; significant costs related to environmental issues; and other risks and uncertainties, including those detailed from time to time in WPG's statements and periodic reports filed with the Securities and Exchange Commission, including those described under "Risk Factors". The forward-looking statements in this communication are qualified by these risk factors. Each statement speaks only as of the date of this press release and WPG undertakes no obligation to update or revise any forward-looking statements to reflect subsequent events or circumstances. Actual results may differ materially from current projections, expectations, and plans, if any. Investors, potential investors and others should give careful consideration to these risks and uncertainties.